this one and only self contained residential generaor system designed to LOWER electric bills not remove them from the grid tied system. it took 8 years to perfect this and 5 years of testing on my home in mesa Arizona. IT WORKES I had three units on my home and lowered my bills an average of $80. per month. no wind in Ariz.
My wife died in August last year I now live in Ecuador on SSI am 72 years old and when i go patent will be lost, it is for sale I have 9 working units in storage in mesa ariz, manufacturing can be greatly reduced by volume. any engineer can answer the question about cogging, i removed it. For a serious ofer and deposit I will come back to Ariz. and show and disclose secreet.look at patent it is just too easy. this system should sweep the world,no maintenance. one moving part that touches nothing, nothing to wear out. 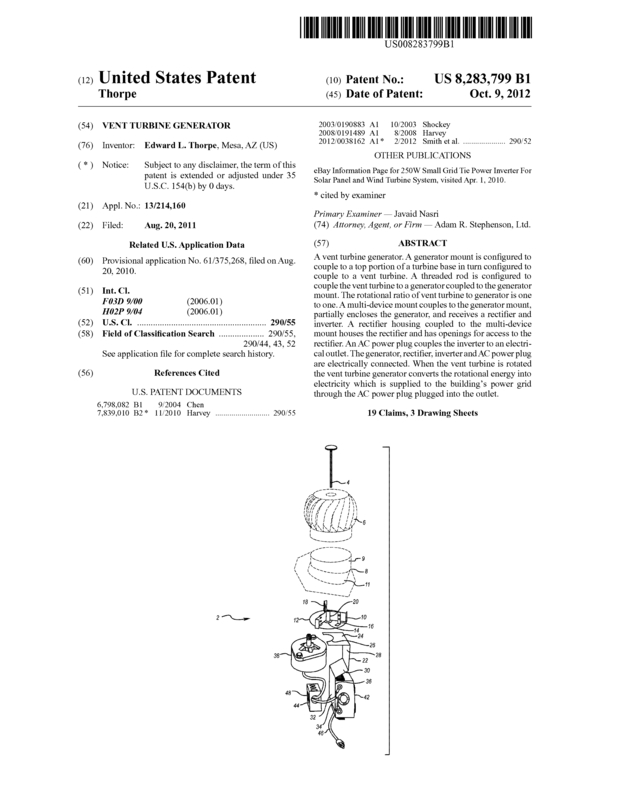 Page created at 2019-04-26 17:57:36, Patent Auction Time.